More than 60,000 years of continuous occupation and culture of Darug People have been acknowledged and honoured at the site of the first convent in Australia. On Saturday 13 October 2018 a launch for the ground painting was held at the site. Guest of honour, artist Danny Eastwood, spoke about the painting and the meaning of the various elements. Danny has named his painting, The Journey. He has used traditional Aboriginal designs to depict aspects of the local Parramatta area, and to reflect the various ministries of groups of Religious Women who have lived and ministered on this site and beyond, including that of the Sisters of Mercy from Callan, Ireland to Parramatta, in 1888. The ceremony began with a welcome to country and smoking ceremony by Darug man Chris Tobin. Matthew Doyle a descendant of the Muruwari people also played the didgeridoo. For over 60,000 years the area comprising present day Parramatta has been occupied by the Burramattagal people of the Darug nation who first settled along the upper reaches of the Parramatta River. 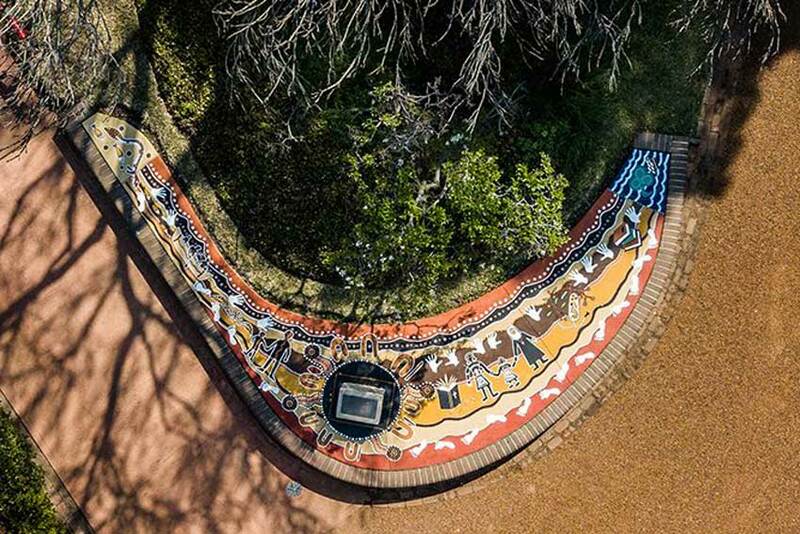 Out of their strong commitment to the recognition and acknowledgement of the continuous occupation and lived culture of the Darug people in this area, the Sisters of Mercy Parramatta commissioned a ground painting by Ngemba artist Danny Eastwood. It is situated on the site of the first Convent in Australia built by the Sisters of Charity in 1839, which now houses the Congregation Centre of the Sisters of Mercy Parramatta and Our Lady of Mercy College Parramatta. Sr Mary-Louise Petro, Congregation Leader of the Sisters of Mercy Parramatta, provided an overview on how the Ground Painting came into being and welcomed the official guests including: Elizabeth Sheppard, ATSI President, Reconciliation for Western Sydney, Bishop of Parramatta Vincent Long Van Nguyen OFM Conv, Sr Cate O’Brien representing the Sisters of Charity, Sr Veronica McDougall representing the Good Samaritan Sisters, Sr Carmel McDonough representing the North Sydney Sisters of Mercy, Ms Elizabeth Scully representing Julie Owens, Federal Member for Parramatta, Dr Geoff Lee, State Member for Parramatta, Members of the Sisters of Mercy Parramatta, representatives and students of OLMC Parramatta, and Maeve Brown of Jesuit Refugee Services, who operate a service on the site. The ceremony concluded with a blessing with water from the Parramatta River followed by a commitment statement from the assembly, and a morning tea in the Convent catered by Indigenous caterers Kallico Caterers. This article first appeared at Catholic Outlook and is used with permission. Previous articleChurch swaps Pokemon GO for Follow JC Go!